I have a friend living in New York City who is a “foodie.” You know, the food nerd who is incessantly trying new restaurants and tweeting photos of dishes before eating them. Nonetheless, I highly regard what he has to say about pizza since we both share the opinion that Joe’s Pizza in the Village is the best New York slice on the planet. 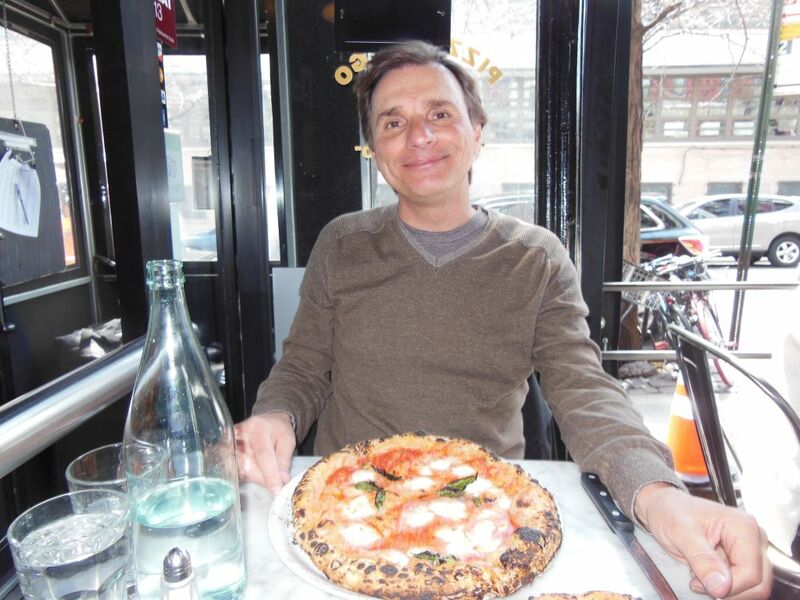 Being a foodie opens you up to a wider culinary universe, and for two years now he has been telling me to try the Neapolitan wares over at Motorino in the East Village. Although Neapolitan is not my style, I can find satisfaction in this space. On a lovely Saturday spring morning, Bro and I parked the car by Washington Square Park and took a brisk walk over to East 12th Street. There we found Motorino’s small open air dining room, a tiny shotgun room with no more than ten tables. While sitting at a table by the window, I watched the flames of the wood-burning oven in the open kitchen and learned of their other location in Brooklyn as well as other ones in Hong Kong and Manila—an unusual road to expansion. 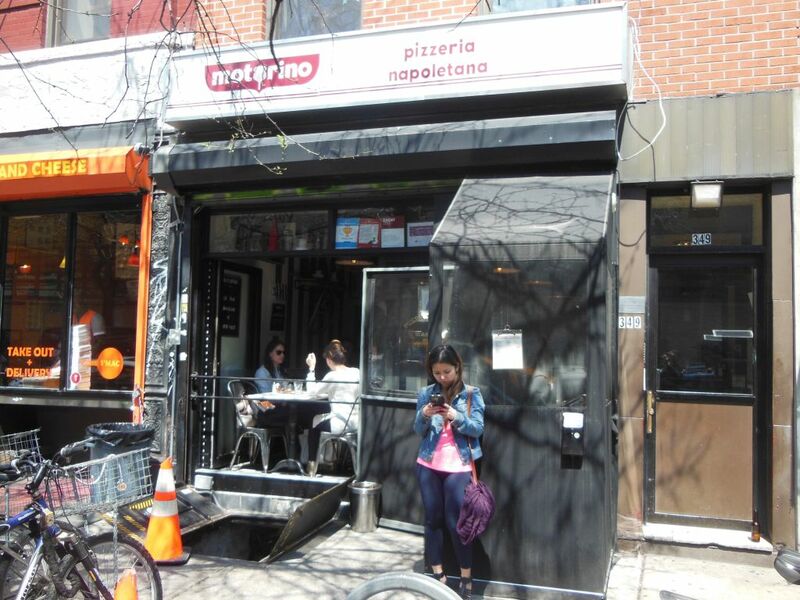 To be as trendy as Motorino, their chef is well-known of course–although simple me has already forgotten his name. Their menu is salads and pizza. As far as toppings go, no pepperoni here. Instead, there are fancy foodie favorites like Brussels sprouts and clams. You will also find the foodie’s fave beverage—wine. 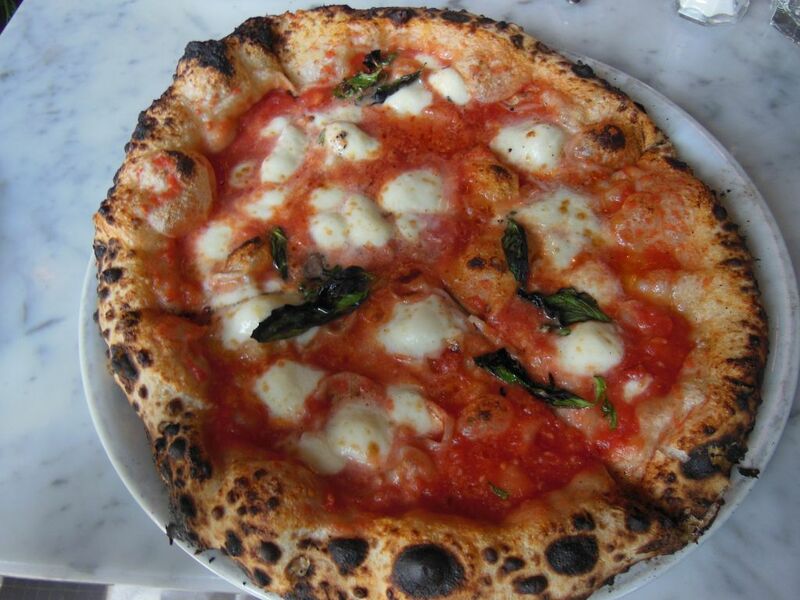 There are a few types of “pizze” to choose from, and our first attempt was to get both a Marinara and a Margherita. The waitress, thankfully, stopped us with a courtesy alert that the former came without cheese. Noting that we could add cheese, my reluctance to revise standard pizza menus had us revert to twin Margheritas which cost us $15 each. The pies, small 10-inchers cut into four wide slices, looked tasty and typical to the Neapolitan style. Being a devout lover of crispy crust, the blackened bubbles on the end crust raised an eyebrow. The mozzarella cheese was scattered amongst a small pool of tomato sauce and olive oil, and the sprinkling of a few basil leaves made the colors of the Italian flag complete. Despite not being my preferred style of pizza, there is no argument that Motorino offers a tasteful delicacy. Made with fine, fresh ingredients, it was truly a delicious work of art. My common complaint of the Neapolitan style pie remains since it was a soupy and sloppy in the middle. Eating it requires the skill of properly folding the slices, so things don’t start falling off of the thin layer of crust. Although cooked fairly well done, this type pie just doesn’t get very crisp. The crust, nevertheless, was quite tasty and chewy. Knowing that I’m the wrong guy to be reviewing a place like Motorino, don’t let me scare you away from the place. It really is a first-class gourmet establishment. 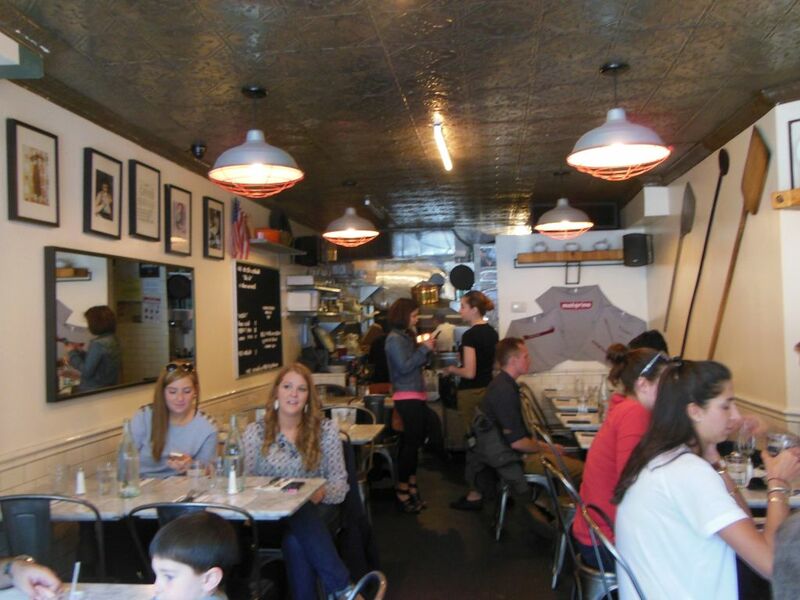 In addition to its tasty pizze, it has that special restaurant charm you can only find in Manhattan. Overall, the Motorino pie has a light taste that doesn’t wear you down with a heavy stomach. P.S. Bro liked it but he said he still prefers a big, greasy, NY style slice. I told him not to worry since the Snob always has another place to try! During the week, they have a lunch special – a pizza and a salad – $12. And everyone needs to try the brussels sprouts/pancetta pie…it’s seminal.